There is ample parking outside the front of the building. If you have difficulty walking from your car to the church, a golf cart shuttle and can pick you up and drive you to the entrance. If you are attending The Conversation contemporary worship service at 9:15, enter through the North doors (the furthest from M-59) and walk down the hallway to the doors on your left leading into Fellowship Hall. There is a coat rack that runs along the wall outside Fellowship Hall. 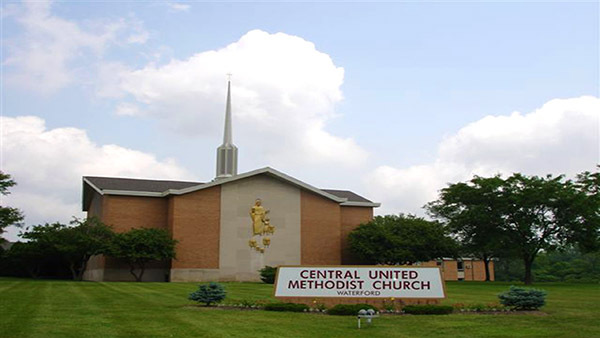 If you’re attending 10:30 worship in the Sanctuary, enter the building through the south entrance (closest to M-59). The coat closet is to your left when you come through the second set of doors. If you are joining us for the Easter Sunrise service (8 am) Blue Christmas (7 pm) or other special services, most are held in the Chapel. Enter through the North entrance (the furthest from M-59) and at the first hallway go right to the doors of the Chapel. Greeters will be at the entrance doors to greet you, provide directions and help you find anything you need. Ushers are also available outside of the worship space to provide direction, help you find a seat or to help guests with mobility issues. When you arrive, please fill out a name tag so that we can greet you by name. Name tags are found on tables outside the worship space. Feel free to dress comfortably for worship! God doesn’t care what you wear, although shirts and shoes (and pants) is the norm. On Sunday mornings, coffee and light refreshments are available before both services. For the Conversation, coffee and refreshments are in the back of the worship area. For the Sanctuary worship service, refreshments are available on a table outside of the Sanctuary. On Easter, breakfast is served from 9 am – 10:30 am. Come by after the Sunrise Service or before The Conversation or the Sanctuary service for a delicious meal and hospitality. Children begin at 10:30 am worship in the Sanctuary with their parents. Outside the main Sanctuary doors are cloth bags with activities to help children follow along with the service. Early into worship, there is a Children’s Message, after which kids 5th grade and under are escorted to Stepping Stones Sunday school by a children’s ministry leader. Children of all ages are welcome to remain in service if that is preferred by parents. During The Conversation, children remain in worship, but there is an area for them to play. Central’s Sunday school is a nut-free zone. Nursery care is available for the 9:15 and 10:30 am services. Children can be dropped off before worship in the nursery, which is located in the east hallway of the main floor. The nursery is clearly marked with signage. Central’s nursery is a nut-free zone. Restrooms are located outside of the Sanctuary in the hallway that runs east from the gathering area outside of the Sanctuary. There is a men’s restroom outside of the eastern-most doors of Fellowship Hall; the women’s restroom is just around the corner in the east hallway of the main floor. The Chapel is near Fellowship Hall, so if you’re coming to Chapel worship you may those restrooms. If you’re joining us as a guest we’d like to give you a welcome gift. As you exit the Sanctuary or Fellowship Hall, please stop by the welcome table for a special gift. To assist you in getting around, feel free to view a map of the church.